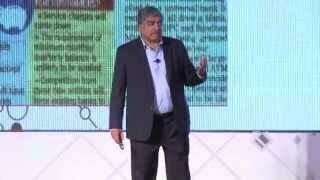 A presentation by Mr. Nandan Nilkeni, erstwhile Chairman,UID project( Aadhar), on the impact Aadhar linked cell phone will create and revolutionize the financial markets in India / world is worth watching . The presentation will make one spell bound and speechless. How the technology is going to change the way we live in this world….. The telecom revolution has changed the desktop based environment to mobile interned based environment. “Whats App movement” is the concept to understand this revolution because today 30 billion messages in a day are passed through Whats App , surpassing the SMS by huge margin. Similar revolution is going to take place in the world of finance making the concept of traditional banking and lending redundant. We are moving from cash based society to cashless and digital society very… very fast. Today India has more 900 million mobile users ( 90 crores) which is a record in itself. The Aadhar when linked with the mobile with IRIS authentication on, will change the world we live in. Today electronic clearing service NEFT- RTGS and IMPS have overtaken traditional payment system. With these 900 million mobile users, a mega trend is underway, which we are unable to comprehend. In simple terms, every mobile user will be an ATM. When IRIS authentication (Biometric linked with Aadhar server) is operative, the 900 million mobile users will be able to have online KYC, online authentication, online payment and online receipt on the basis of Unified Payment Interface (UPI). Smart phone will replace all type of debit and credit cards and Paytm/MobiKwik like system will be fully operational. Physical cash to digital cash and digital cash to physical cash convertibility will be a game changer. Digital wallet and digital locker will revolutionize the security system. Enabling peer to peer payment system will do away many intermediaries and will be re imagining the infrastructure we have at present. The whole process will lead to explosion of innovation, death of many businesses and birth of new ventures and business. India will become data scare to data rich country in five years in both, on consumer and business side. Credit process and credit appraisal will become obsolete and online loan payment will become possible. Think of 900 million people coming on one platform and remain connected!!! Almost all functions of the bank, government and taxation department will be done by Aadhar linked phones. This is even more important as IRIS authentication on cell phone is available only in India, no one has this system in the world!!! So prepare yourself to live in the digitalised India with absolute transparency, no paper work, no bureaucratic intervention, no tax terrorism and much much more. Previous Post Previous post: Above Average Effect: Everybody Ranks Himself High in Qualities He Values!! !